TMEP.eu is cloud service which saves and shows your data from weather station. Josef created other weather station. The base board of this project is development board by Adafruit called ESP8266 Huzzah. Weather station also contains the charger board for Li-Ion/Li-Poly battery. All values are showed on tri-color ePaper display with dimension 2.9". The inside temperature/humidity is measured by popular DHT22 sensor. Current values of outside temperature/humidity are downloaded from tmep.eu website. The power consumption during sleep mode is only 0.09 mA. Josef used 18650 Panasonic battery with 3350 mAh. This weather station is working with this battery more than one month. The assumption is up to two months. The data is updated every 30 minutes from zvolanek.tmep.cz, data on this website are sent by the first weather station (with big ePaper display). The weather station with tree-color ePaper display measures temperature and humidity inside, big one-color ePaper display measures temperature and humidity outside. Source code for Adafruit ESP8266 Hazzuh is here. 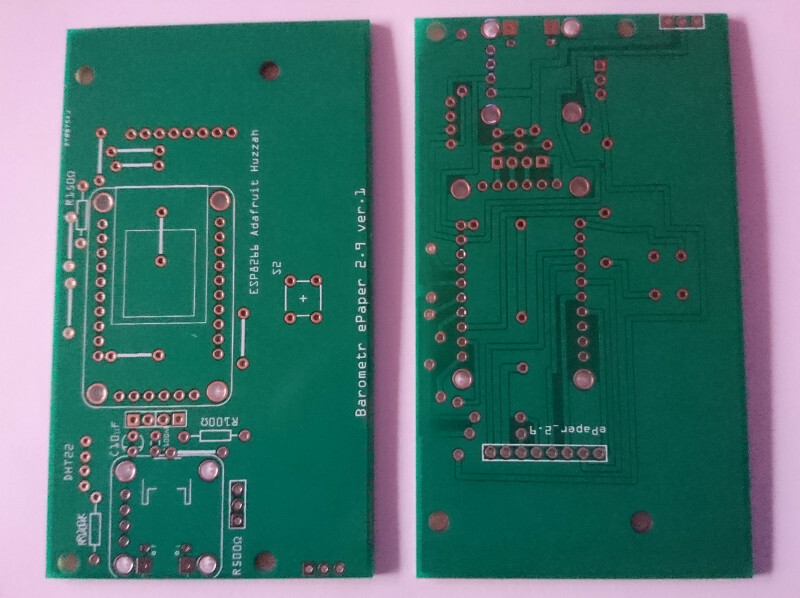 Gerber data for PCB is here. Some comments can be in Czech language, sorry for that. Picture of PCB is below.